Service providers and companies with dispersed branch offices face the challenge to financially justify an investment in a fiber-optic infrastructure project, in case when they only need two strands of fiber to establish high-speed connection. The whole process is quite costly since the implementation involves complex activities, such as route planning and design, obtaining permissions, creating ducts and channels for the cables, blowing cables into ducts, fusion splicing, installations at end-point premises, making measurements and generating test reports, mapping connections and finally system integration. 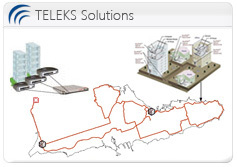 If you are looking for fiber links ready to be deployed in no time and provided at highly competitive rates, TELEKS may be the partner you are looking for. We own and operate an extensive fiber network in Macedonia, covering key end-points in the Capitol, as well as end-points to border crossing points, industrial zones, etc. We lease fiber connections at highly competitive rates, enabling companies to jumpstart using high performance data links in no time. Our networks is safe-guarded 24/7/365 by skilled professionals with years of expertise and hands-on experience. Professional and certified project design, as well as feasibility studies. Project management and complete project implementation, including infrastructure construction backed by top-notch installation equipment and certified staff. Advanced network analysis, including comprehensive testing, reporting and technical documentation. 24/7 professional maintenance services using world-class Service Level Agreements. Our services are backed by ISO 9001:2008 management system, 30 years of experience, cutting edge technology and highly qualified staff. Our experts are ready to offer you solution-oriented consulting, free of charge. Please fill out this form to send us your request.